April proved to be quite a productive month, and in unexpected ways! It brought some long awaited events, a few unexpected ones, and many hours in the car - but all for the love of demos and supporting friends. The Long Awaited: I can always count on the first weekend in April for the UMass Dartmouth MFA Thesis Exhibition opening. It's a day of celebration with friends, family, studio mates, and colleagues after three years of hard work. Having been there myself, I look forward to not only visiting my alma mater, but also supporting the jewelry/metals candidates. Those graduating from the program this year hold a special place in my heart as they started their graduate work when I was in my last year and preparing for my thesis show. It's a come-full-circle type of thing, I suppose. 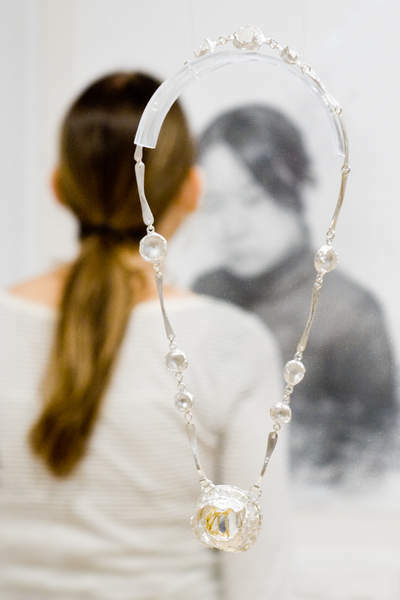 And so, a very hearty congratulations to Cuong Sy, William Vanaria, and Lillian E. Webster, who's neckpiece is pictured here! If you're in Boston during the month of June, be sure to stop by Bromfield Gallery to see selections from the MFA Thesis Exhibition. Another thing I can count on is an invitation from my friend Mr. Chase Stevens. Previously, he invited me to be part of a (Side)show at Guts & Glory Ink, but this time he asked if I would speak to his high school Art Club students, and what better time to stop by the Hudson Valley than on my way out to Massachusetts. 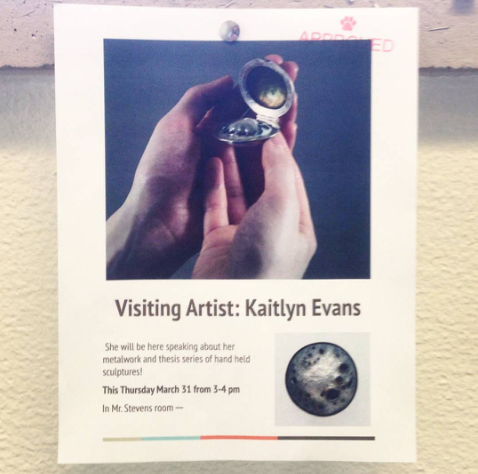 When I was in high school, I didn't know the worlds of metalsmithing and art jewelry existed. I wanted to introduce these students to jewelry that goes beyond the readily available, easily accessible, and mainstream that we so often see. 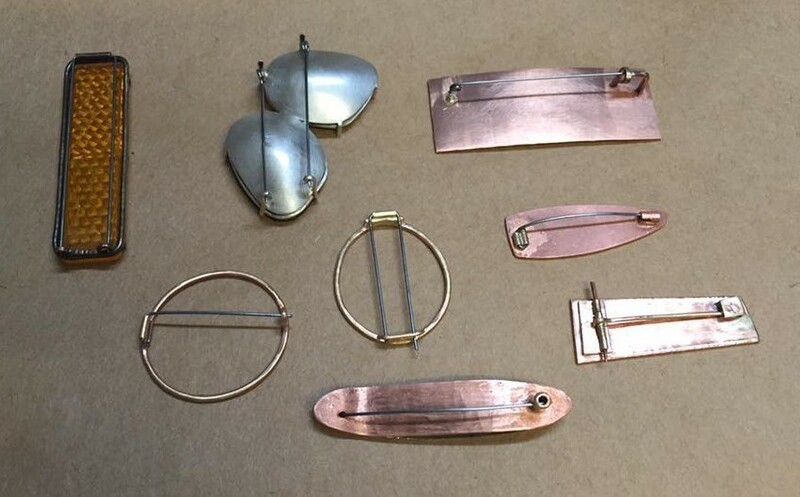 And, I wanted to share with them metalsmiths who create sculpture, furniture, flatware, even machines in addition to jewelry, to show the versatility of these artists and their skill sets. Of course I brought a lot of my own work so the students could get a hands on understanding of metalsmithed objets. Chase let me know it was a successful and inspiring talk, especially for one of his students, who will soon be off to college in pursuit of a fine art degree! A couple weeks later I was on the road to Pittsburgh for a little pin back action! 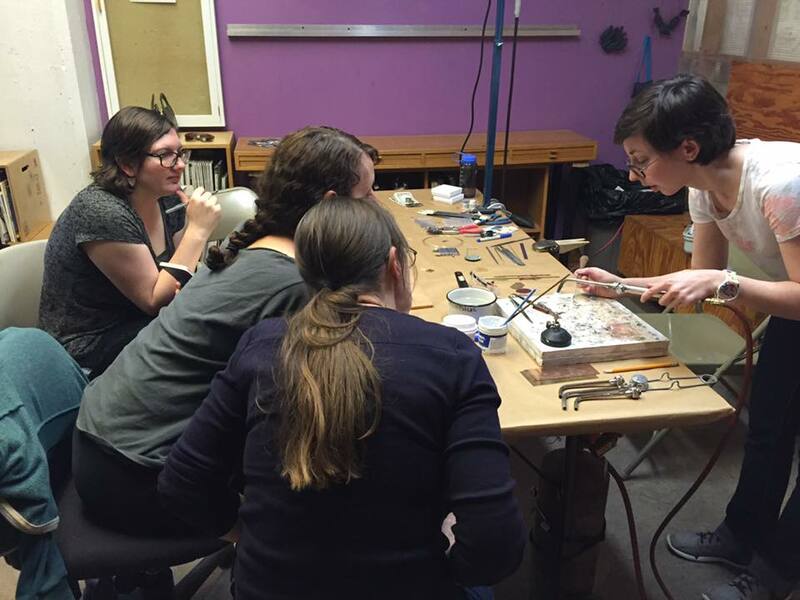 I volunteered to demo for the Allegheny Metals Club, which meets at the Society for Contemporary Craft. It's a bit difficult to compete with a warm and sunny spring Saturday in the Strip District, not to mention a hammer workshop by Mr. Glen Gardner in the next room (I was sad I could not attend the 'hammershop'! ), but it was great to be in such a lively studio! I demoed a pin mechanism that is simple, yet effective, and also showed a variety of successful (and not-so-successful) samples that led to some great conversation about what to look for in a mechanism, how to make it, and even some problem solving. My weekend stay in Pittsburgh was extended when my sister connected me with the art teacher at the high school where she teaches. I met Ms. Hess, who was excited to have someone show her 3D classes, who have completed some jewelry projects, another aspect of jewelry making. We decided on a quick and simple introduction to enameling, and after a short demo, I was managing kiln traffic. The energy and interest of the high school students surprised me, and just as with Chase's students, I think this mini intro to jewelry caught the eye of at least one college-bound student. Unfortunately for me, these students knew their class schedules better than I and were out the door before I thought to snap a picture.